You own a Canon 5D, and you are on the lookout for the best gimbals to stabilize your camera? Well you have landed on the right page. There are many different gimbals on the market that can hook up to a Canon 5D, but not all are what you would call “fit for the job”, as you could end up purchasing lots of different add-ons, or worst case scenario, end up dishing out of a brand new one if it breaks. We have carefully selected for awesome gimbals that we feel, will not only stand the test of time, but deliver in the most important areas, capturing wonderful, smooth images and bring you the most bang for your hard earned bucks. The Canon 5D, curently Mark 4 is considered one of the best DSLR cameras that has ever been produced. We know the Canon 5D delivers when it comes to video, so it’s super important your gimbal not only matches it performance, but enhance it. Have a look at our best four gimbals we think are the best matches for your Canon 5D Mark III or IV and not only delivery you beautifully smooth footage, but also give you different option of hand control and more importantly, securing your camera and ensuring it will not fall off during the more testing filming moments. The Pilotfly H2 available here on Amazon is one of the best handheld gimbal that supports bigger DSLR cameras easily. The gimbal has an extremely lightweight handle with a 4 way joystick, offering you to switch the pitch and roll angles, literally within seconds. If you are worried about the gimbal holding the bulky 5D, don’t be. 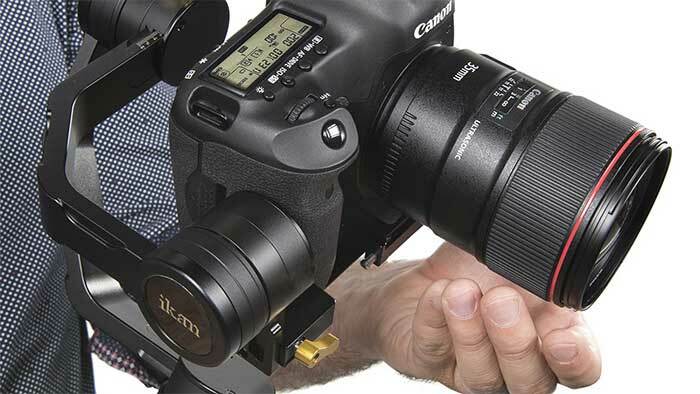 It will easily connect to the camera and stabilize it, giving you peace of mind that your Canon 5D won’t fall off when put through some sterner tests. One of the top features of the Pilotfly is the ability to connect it to a wide variety of different items, including, jibs, extensions poles or stabilizing tripods. This alone give the buyer most options depending on what they are looking to film with their 5D DSLR. The motors are designed to have literally no limitations on the Yaw and Roll angles, twist and turn the gimbal 360 degrees without any compromise whatsoever. Pilotfly’s H2 gimbal can also be configured with 5 different user modes, giving you the option to switch the gimbal settings that best suit the situation within a few seconds. The device is equipped with Bluetooth and firmware that upgraded on a regular basis to ensure you are up to date with the latest technology. Pilotfly have literally thought of everything with the design to enhance your Canon 5D camerawork. Similar to the Pilotfly H2, the BeHolder EC1 is generally considered one of the best handheld gimbals ever to hit the market. There are a lot of similarities to the Pilotfly, the main one being is awesome design and unlimited rotations through all raw, pitch and roll angles for 360 degrees. The BeHolder offers not 3, but 4 different modes. The three follow modes that most great gimbal have, but also a fourth mode for auto inversion that allows the camera to be operated upside down! The interface on the handle has a LED screen that give you lots of important information such as battery life and the mode you are currently set to. 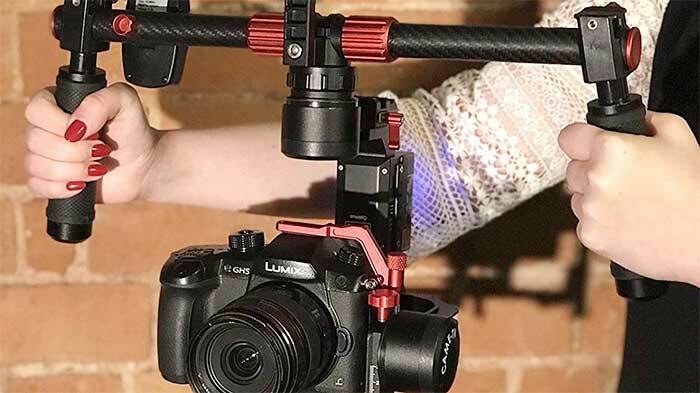 It is very much like the Pilotfly, although it doesn’t offer quite as many add-on functions, it does have a screw-able handle that can connect the gimbal to tripods, monopods and extension poles. The BeHolder comes with 3 rechargeable batteries that should last for around 3 hours of constant usage. 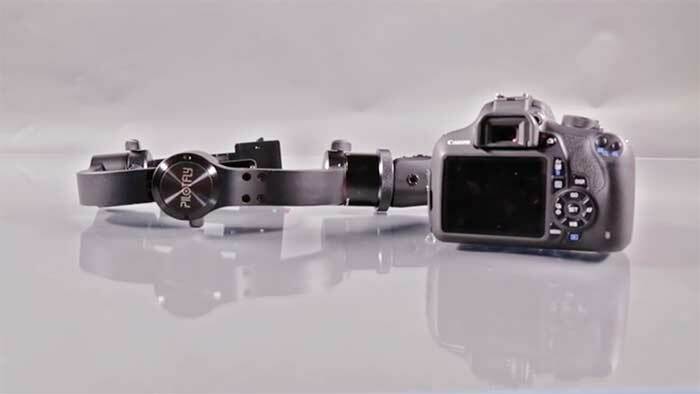 If you are looking to dismount your Canon 5D quickly from the BeHolder, there is also a quick release plate to allow the camera to be removed, literally within a couple of seconds. The Gimbal is an outstanding bit of kit, that will smoothen any camerawork and take your images to the next level, we are sure of that. 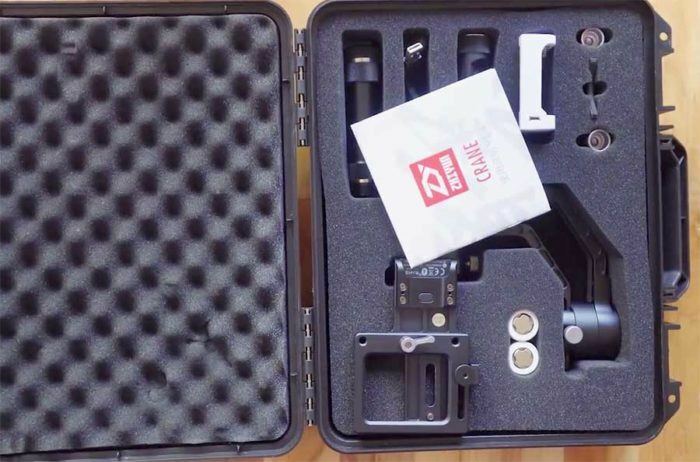 The Zhiyun Crane (our top DSLR gimbal)is designed to hold mid range mirrorless cameras, making it an ideal choice for those looking to stabilise their Canon 5D camera. What makes the Zhiyun different from the already mentioned is the ability to add longer lenses through the attachable lens support adjuster. Another unique feature is the battery selection you have. The Gimbal supports two sets of batteries – models 18650 that provides around 6 hours of non-stop usage or the 26650 model that offers users up to an incredible 12 hours of operational time. This feature is unique to the Zhiyun Crane and it could be a gamer changer for those that require to film for longer periods without recharging. Similarly to the Pilotfly gimbal, The Zhiyun has an easy to use joystick on the handle, giving you the option to flip between the 3 different modes, fast and easily, should you need to in a spontaneous moment. There is also an online application that the users can download, so that they can operate the gimbal from most IOS and Android devices. The gimbal can also be hooked up to a wide range of stabilizers and other add-ons you might wish to use. The Zhiyun is definitely one of the best camera motion stabilizers for your Canon 5D Mark III, IV or older, especially if you are not looking to spend thousands of dollars. The Came -TV Optimus allows for one hand operation as everything you need to set within the handle of the device. All the motors can operate “full circle” of 360 degrees. The joystick located on the handle allows for manual operation (up, down, left and right) movements, keeping the motion level at all times. The Came-tv Optimus supports small to mid-range mirrorless cameras, and the Canon 5D is just about within reach. If you have something slightly bigger, then we would advise you on selecting a different gimbal. The battery life on the Optimus is a fantastic 10 hours when it’s fully charged up and that is one of the biggest power loads of all the handheld gimbals. One thing to keep in mind is the Optimus gimbal does cost slightly more than the previous mentioned, but if you are looking for a stylish gimbal to help you create beautiful, smooth imagery with your Canon 5D, then it is definitely one of the better handheld gimbals out there. One of the most important questions when you are on the lookout for gimbal, is what you intend to use it for? Are you looking to add an external magic arm? Are you looking to change the camera quickly in between shots? There are many different situations a user might want compared to a different operator. We have carefully selected the 4 gimbals above that are the best on the market of the Canon 5D, and we should have covered every possible filmmaker desires. Maybe you are looking a gimbal that can be mounted on a helmet or on a bicycle? Maybe you are looking to operate the gimbal wirelessly via your smartphone via Bluetooth? One thing is certain, most users like to have a longer battery life and want peace of mind that their Canon 5D is securely connected to the gimbal and we think we have all the areas covered with the great handheld gimbals we have reviewed above. 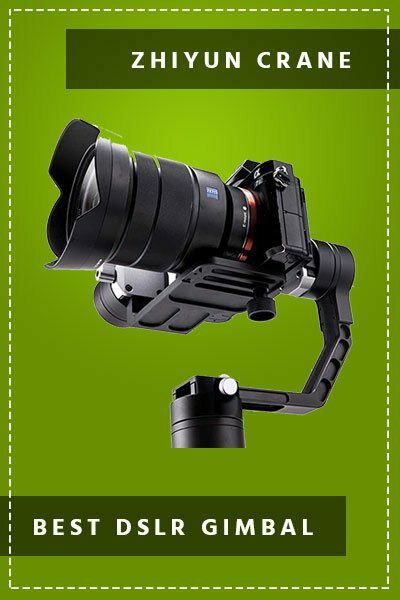 The prices range anywhere from 500 dollars to around 1200 dollars, which is a lot less than us serious filmmakers was paying out for professional gimbals, only a few years ago. The last thing we want to point out on is the wonderful, silky smooth footage each gimbal produced, no matter which you select for your Canon 5D from the above, you can be sure the gimbal will enhance the quality of your videos. Do all these gimbals have cables to connect to a Canon 5d4 to control the camera shutter and other features ?